Super Mario has ALOT of games...but some of them are less notable than others. One of these such games is Super Mario Sunshine. This game was to be the successor to Super Mario 64,however most passed it off as a failed attempt. In my eyes however that game was...good on its own two feet rather than trying to be "Super mario 128". The overworld that was used could have been better,but it was very tropically colorful and fit the Mario universe very well. The major addition to Super Mario Sunshine was FLUDD. It shoots water, and offers a few abilities, including spraying water like a hose, and shooting water straight down allowing you to hover, which basically is used to jump over long distances. Although it's fun at first, and is very easy to use, it still feels more like a gimmick than a great advance in video games, as opposed to in SMB3 when we flew for the first time. Like Mario 64, you go through each level multiple times to complete different challenges, some are downright tedious and frustrating. Some are fun, like the old school levels. At least one time in each Level there is a moment where you lose Fludd and have to go through what is pretty much an obstacle course. What it really is however,is an all out platforming excursion.You'll come to love these, as some of them add the only true difficulty to the game but also the most fun. Since it's a pretty simple game, the controls tend to flow very smoothly. You don't ever do anything you don't intend to do, and the FLUDD system is added very nicely. The right analog stick controls the camera and probably the most annoying problem with the game. The camera gets stuck in some of the ugliest places and adds unneeded difficulty to an otherwise "Mario veteran's" cakewalk. All in all though, it's still a Mario game. The best news is, it feels like a Mario game. The platforming levels are great. There's also a good mix of some other missions, such as surfing and some easy, but fun bosses that are thrown in to change up the pace. Yoshi is also in this game but sadly he's pretty useless. There are a few missions where Yoshi's required but they seem to just be thrown in to give Yoshi some purpose. 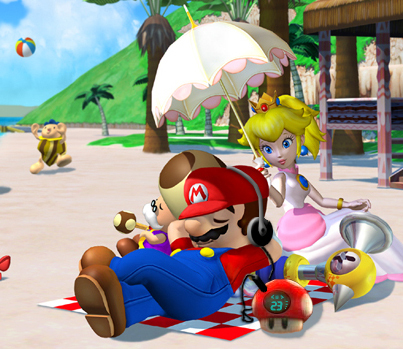 Overall i enjoyed my time with mario sunshine.I would totally recommend this game if you have a wii/gamecube just lyin around and nothing but some time on your hands.